For the refurbishment and expansion of the Museum Of Free Derry, artist Locky Morris (web | ig) created in metal a soundwave of marchers on Bloody Sunday (January 30th, 1972) singing the civil rights anthem We Shall Overcome (BBC-NI). The Bloody Sunday Centre and Museum Of Free Derry originally opened in 2006. Shown are the White Witch (Jadis) and two wolves, Maugrim – Captain of the Secret Police – and Vardan (from the movie adaptation). The piece is called “Winter’s End” however, because Jadis’s reign over Narnia – the winter of 100 years – is under threat from Aslan the lion. The piece is by Friz (web | tw). The two images below are in-progress shots from March. For the metalwork in the top right, see Chains & Ropes. 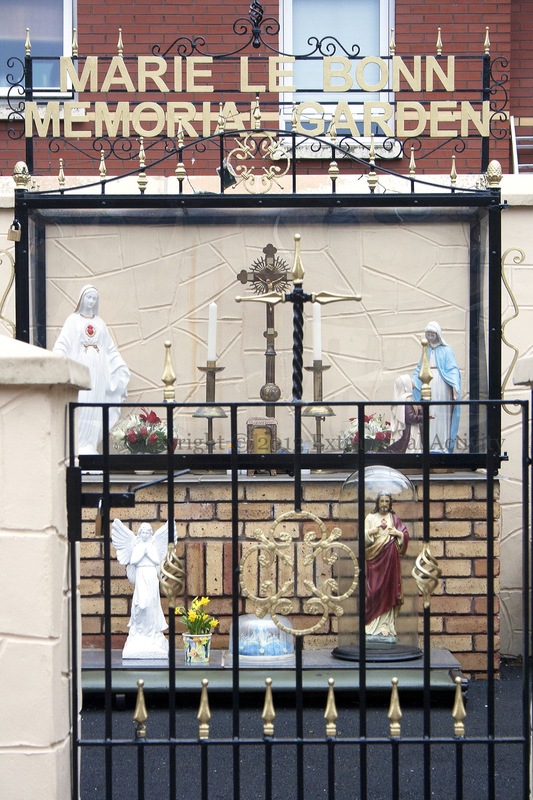 The corner – which is typically beset with cars – is in Townsley Street/Manderson Street, Belfast, next to CS Lewis square. Here are two more of the metalworks created by Alan Burke (see previously Metalwork) reflecting the industrial heritage of east Belfast. Above are the ropes and chains of a ships’ dock; below is the title piece, “Of The River”, named for the nearby Connswater River. Video of the launch. Here are two versions of CS Lewis’s character of Aslan, from The Lion, The Witch, And The Wardrobe and the rest of the Chronicles Of Narnia, one by Glen Molloy in Bawnmore (alongside The Night King from Game Of Thrones) and the other by Alan Burke in Townsley Street (near Metal Work). Newcastle artist Alan Burke in 2015 produced four pieces for Eastside Partnership (with funding from the Arts Council) for the area between the Newtownards Road and (what is now) CS Lewis Square (Tele). The piece shown in today’s post is a pair of metalworks depicting the heavy industry of Harland & Wolff. The works themselves are made from sheet metal, stainless steel, and weathering steel which is designed to “form a stable rust-like appearance” after a few years of exposure the elements. A small memorial garden in Clós Ard An Lao/Ardilea Close. There is no record at all, on-line at least, of a Marie Le Bonn.